There is much to be done within Egypt to address its economic depression, which will rely on building public and international investor confidence. The scale of the economic task facing Sisi is daunting. Sisi must create a new economic roadmap for Egypt. Demotix/Hussein Tallal. All rights reserved. The hiring of Lazard and Strategy& to develop an economic roadmap for Egypt could be a sign that newly elected President Abdel Fattah el-Sisi is keen to make inroads into the economy as soon as possible. Firstly, this would address unmet popular Egyptian demands for jobs and affordable housing. Secondly, it would remove any pressure from the Gulf states to implement reforms and channel their funding ($12 billion since 2011) into more productive economic sectors. The UAE appears to be taking the lead in the process, along with Egyptian consultation and a range of economic and political actors, the most prominent of which so far is former British Prime Minister and the Quartet Representative for Middle East Peace, Tony Blair. He appears to be well placed with links to Sheikh Mohammed bin Zayed al-Nahyan, a position against the Muslim Brotherhood, and access to various international political and business contacts. However, much work needs to be done within Egypt to address its economic depression following a collapse in tourism and foreign investment from 2011 and in laying the foundations for further economic development. It will take a significant period of time, perhaps years, to claw back lost tourism and investment revenues (foreign reserves have halved, reaching just $14 billion last year), much of which will rely on building public and international investor confidence. The sheer scale of the economic task is also quite daunting, with nearly half the Egyptian population (about 40 million people) now living in near or absolute poverty. A huge and coordinated international effort is required. Still, there are signs of change. Fuel subsidies (which cost the government $20 billion a year) are already being cut back and prices are slowly rising at the petrol pumps, illustrating that some significant steps are now being taken. Paying foreign hydrocarbon companies will ensure a good flow of energy imports beyond those already supplied by the Gulf whilst consumer education would also go some way to reducing energy use and maintaining an uninterrupted supply of electricity. Left unchecked, the situation will only deteriorate as additional pressures are put on the energy industry, such as the need to build and operate water desalination plants. Furthermore, without subsidy reform in place (direct payments could be paid to the poor as a much more efficient mechanism, as they have been in Iran and now in India), the government will be unable to tackle inflation associated with necessary increases in government spending on health, education and housing. The army in conjunction with UAE companies such as Arabtec are constructing a million housing units for low-income youth, but even this is insufficient since 15-29 year olds make up three-quarters of the unemployed and there are many other groups on low wages which will be unable to afford such housing. There is therefore space for other international donors to substantially increase the number of units available and the price at which they are sold. If further concrete steps are made according to a roadmap which is supported by the international community, particularly turnkey investors such as the IMF which once described Egypt as an "emerging success story", it would encourage other bilateral and multilateral investors to come on board. President Sisi could easily secure the IMF's Rapid Credit Facility of $750 million and would then be in a better position to manage economic development based on a four or five year plan, reducing the fiscal deficit and public debt (which rose to almost 100 percent of GDP by the end of 2013) and establishing a more certain legal environment for investors. This would probably impact relations with the USA and EU positively as their businesses and investors depend heavily on such measures being taken. Of course there are other options and Egypt has explored issuing Islamic bonds which could potentially raise $10 billion per year for the state coffers. However, this process has been delayed and is generally regarded as sustainable only as a short-term measure. The same is true of reducing unemployment through providing hundreds of thousands of additional jobs in the public sector. More important is a basket of economic measures to attract ongoing financing which will be delivered at different intervals. Whilst billions of dollars may be committed to Egypt, much of it will be paid in separate installments over a period of time. President Sisi now has two immediate tasks to focus on in managing the economy. The first is making sure the proposed economic road map is effective in jump-starting the economy whilst addressing the immediate needs and concerns of millions. The second is directing the cabinet and central bank to take the necessary decisions to improve the lives of ordinary Egyptians rather than cause further economic hardships which could spark more political instability. His plan to generate additional cash ($13 billion per year up from $5 billion per year now) from improving and enlarging the Suez Canal is a good start. With military support and $8.4 billion set aside for the task, he will effectively double its capacity in nine years and provide a much needed cash injection into the economy from Egypt's cash cow. It is also likely to attract foreign investment from states such as Russia, which has recently indicated that it will build an industrial and free trade zone as part of the project. However, it is geo-politics which will benefit Egypt the most vis-à-vis exports to Russia. For example, Moscow's current ban on imports of European foods will increase demand for Egyptian exports such as citrus fruits, potatoes and onions. Indeed, such Egyptian exports could double in size, from $3 billion in 2013 to possibly $6 billion in 2014. These are relatively easy gains, but other similar sized boosts to the economy will likely require structural transformation and therefore take time. 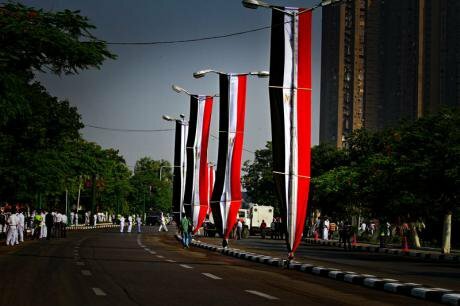 The international community, especially the Gulf states, will continue to play a vital role in Egypt's economy. An international donor conference like the one proposed by Saudi Arabia or an equivalent framework will remain necessary to encouraging further investments and giving them more direction, coordination and a longer term strategic focus allied to Egypt's needs.